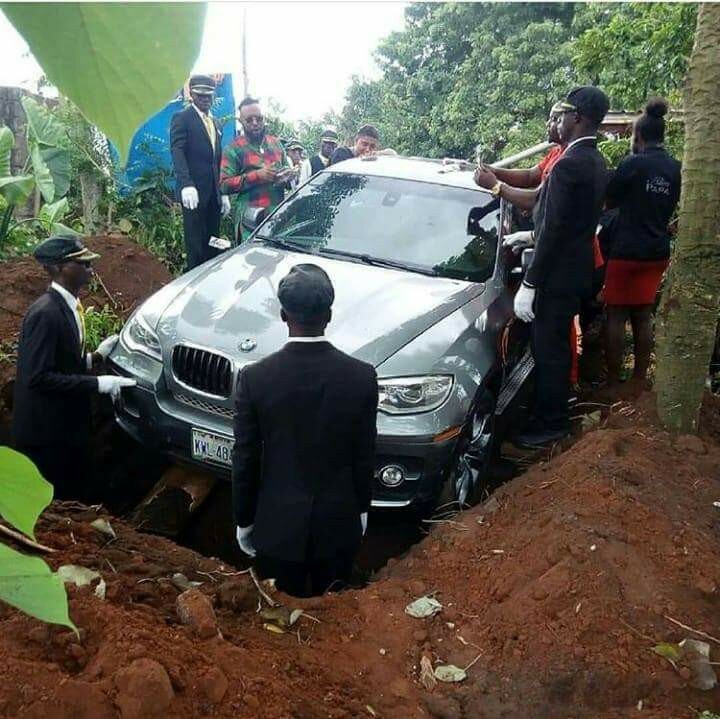 A Nigerian man has shocked many people after he reportedly buried his father in a brand new BMW worth millions of naira. The man simply identified as Azubuike left tongues wagging by the act. It is not yet known why he buried the father in a car instead of the normal casket. The burial reportedly took place over the weekend at Anambra State, where the late father was allegedly residing. A Facebook user, Amobi Nwaokoye Okoye‎ shared the photo and wrote: "NIGERIAN MAN AZUBUIKE BURIES HIS LOVELY FATHER WITH A BRAND NEW BMW WORTH N32MILLION NAIRA, IN HIS FATHER'S VILLAGE WHERE HE WAS LIVING IN IHIALA LGA, MBOSI, ANAMBRA STATE."